Years ago, we caught wind of some fine Mega Man hoodie concepts DeviantARTist Brendon Phillips. Now, according to a listing at Rakuten, Capcom and Japanese clothing brand Punk Drunkers are teaming up to make them a reality. If you have the means to do so, you can pre-order them at Rakuten. 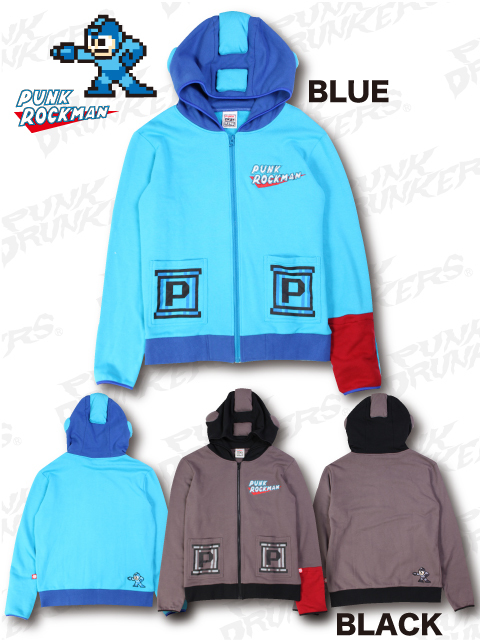 I don't believe Punk Drunkers' apparel is available abroad, so rev up those eBay accounts, folks. Blue will always be the best. The black one makes me think it would be more suitable with a Bass design. I wish these were more fashionable. They should make a varsity type design, that'd be stellar. It's safe to say I could do without the P-Tanks and the rather odd red hand. Otherwise, it's very close to the fan created ones we saw a while back. Those which I would prefer these official products looked more like. I wanted it for the hood, but the P-Cans and that red sleeve kill it for me. Oh, and the fact that it's $170ish. Oh c´mon srsly?? would somebody put this thing on? it´s more suitable for a toddler....geez. Life is so horribly unfair. You know... I like my sweaters long and baggy. So... those P-Tanks would he hanging... roughly over my "P-Tanks." I wonder if that's what they had in mind. I must admit I do not like the P tanks; but they seem to be pockets which I could easily modify off and replace with a plain colored fabric. I DO like the Megaman on the back. I really just can't spend that kind of money on a hoodie. Will they release more info on it? Like what fabric it is and how wheater proof it is? If it were high quality enough I might reconsider. I would actually consider getting this if it weren't for the red sleeve and the fact that I simply do not have that kind of money to throw. I mean, I would consider it if it were around $60. Poor college student, y'know? I can deal with the P-tanks and 'Punk Rockman' on the front, and I would love to be the only girl (screw that, the only PERSON) on campus rocking with a Rock hoodie (harhar), but I just can't afford it. And I want to rip off the red sleeve. That too. $180?! For a hoodie? Not even the most expensive hoodies at Hot Topic (which is ridiculously overpriced) are that expensive! If the quality is good, I can sort of understand. Still, I am the kind of person who shops for clothes at friggin' WAL MART for a reason! What is up with that red sleeve anyways? It looks so out of place. >.< Why not make BOTH sleeves dark blue? That would make more sense and it would look a lot better. The P-Tanks are another problem, but they don't bother me as much as that red sleeve. If I do buy this thing, it would be as something to put into my collection, not as something I would wear in public.